Tough as nails with great military styling, the Prospex Solar Flight Chronograph, model SSC277 boasts an easy to read black dial, a complete E6B Flight Bezel and a date display. 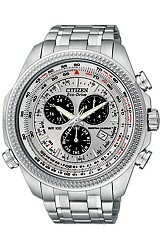 The Chronograph has 3 sub-dials and orange accents. 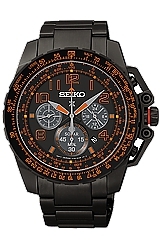 Seiko's Solar Flight Chronograph takes its energy from light (sunlight or indoor light) and stores it internally. Seiko's legendary quartz movement ensures accurate time keeping. 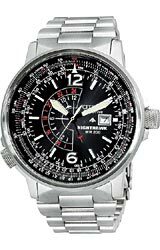 Top Flight Watches is a AUTHORIZED SEIKO USA internet Dealer and every Seiko we sell has SEIKO'S three-year limited manufacturer's warranty. Conversion Scales and Flight Computations Including Speed, Fuel Consumption and More.